#1 Poker Odds Calculator Online 2019 - Easy, Fast & FREE! Get Your Odds of Winning - Fast, Simple & Free! Poker is a game that can deliver thrills, spill, twists, and then some, with it rightfully ranking as the No. 1 card game in the world. With our poker odds calculator it's easy for you to make the right call in any situation, whatever poker hand you might have. You can leave it running in the background every time you play online poker, and can even export your odds to your favorite forum or website to get feedback on your plays! Here's how it works. So, What is a Poker Odds Calculator? Every player is looking for an additional edge when they&apos;re at the tables, as the right assistance can prove to be the difference between defeat and victory. A betting odds calculator – specifically the CardsChat poker odds calculator – is a preferred tool for thousands of players. But, what exactly is a poker odds calculator? A poker odds calculator is a piece of poker software that lets you run any scenario that you see at a poker table. Once you can see what cards you have, and what cards other players have, the poker calculator will go to work and, in a matter of seconds, tell you what your odds of winning are. There are no guarantees but, in the long run, using this kind of statistical information can give you a real edge over players that don't realize what they're missing out on. How Do You Use a Poker Calculator? Check out the quick video below to see just how easy it is to use the CardsChat.com poker odds calculator! Start by selecting your game of choice using the drop-down list in the top left-hand corner. We have built the poker calculator to provide poker hand odds calculations on Texas Hold'em, Omaha, Omaha Hi/Low, Seven Card Stud, Seven Card Stud Hi/Lo, Seven Card Stud Hi/Lo No Qualifier, and Razz. In this example, we'll assume that you chose Texas Hold'em to use with the poker odds calculator, but the same procedure applies across the board. To get things started, simply select the two cards that you're holding by clicking on both, the suit and the card, which will appear in your hand above. Finally, you'll see the overall odds are already calculating and they continue to do so, even as you add in the community cards. Using the CardsChat odds calculator effectively gives you a simple snapshot of what you can expect and, like any good poker calculator, makes it easy to make the right decision quickly. JOIN OVER 276,195 OTHER PLAYERS WHO HAVE BECOME MEMBERS OF THE CARDSCHAT FORUM TO IMPROVE YOUR GAME AND PARTICIPATE IN EXCLUSIVE EVENTS WITH OTHER MEMBERS. Why Use a Poker Odds Calculator? So many top poker players turn their noses up at the idea of using a calculator, as think they have what it takes to make the right decision based on their gut instincts. But, until you have years of experience on your side mistakes can – and often will - happen. And remember, even one or two crucial mistakes per hour can easily be the difference between being in the winner's circle and walking away with a much lighter bankroll – that's just how our No Limit Texas Hold'em odds calculator can help you. Someone that is lacking experience should be looking to learn with every hand, with a poker calculator that becomes much easier. With a poker calculator in effect you can do more than just “monitor” the game, you can obtain a further grasp on what hand beats what as you play. For all but the most experienced poker players, using an online poker calculator to hone your skills should be a simple decision. Even just using this odds of poker calculator to run hypothetical situations can be a valuable learning opportunity. Poker can often be a data and calculation intensive game, especially if you choose to address the table in a manual fashion. A poker odds calculator allows a player – in a sense – to play in an automated fashion. You don&apos;t even need to remember the hands, as a calculator can take care of that for you. Essentially, while you make the decisions, a poker calculator picks up the slack for the analysis side of the game so you don&apos;t have to. Poker has become the game of the people, so competition is picking up no matter where it is you choose to play. For that reason, any and every player needs to take the steps required to ensure that his or her game is on point. Helping you step up to the table and deliver an all-around performance, here are a few ways that you can improve your game. Think you can play poker blind successfully? Think again, as every successful player looks to carry a poker strategy into battle. Now, there are countless poker strategies out there, some of which are easy to adopt, while others prove to be a little more complicated. No matter the strategy you opt for, you need to understand the importance of using it, along with how it can make you a better player. This might sound like a given, but you need to actually understand what hand beats what when playing Texas Hold&apos;em. To get you up to speed, here&apos;s a quick rundown of hand order. Poker isn&apos;t just a fun card game; it&apos;s a sub-culture unto itself. It&apos;s even generated its own terminology, so you are going to need to have a sharp ear should you really want to understand what&apos;s going on at the table. For any prospective poker player, it&apos;s worth looking into poker&apos;s terminology, so you can know your short stack from your showdown when in the heat of play. You can use this simple odds chart for calculating odds and probabilities while playing, helping you to decide which bets to make. It has basic hand odds given the number of "outs" after the flop or after the turn. Feel free to save this image to your computer for use anytime you need it! 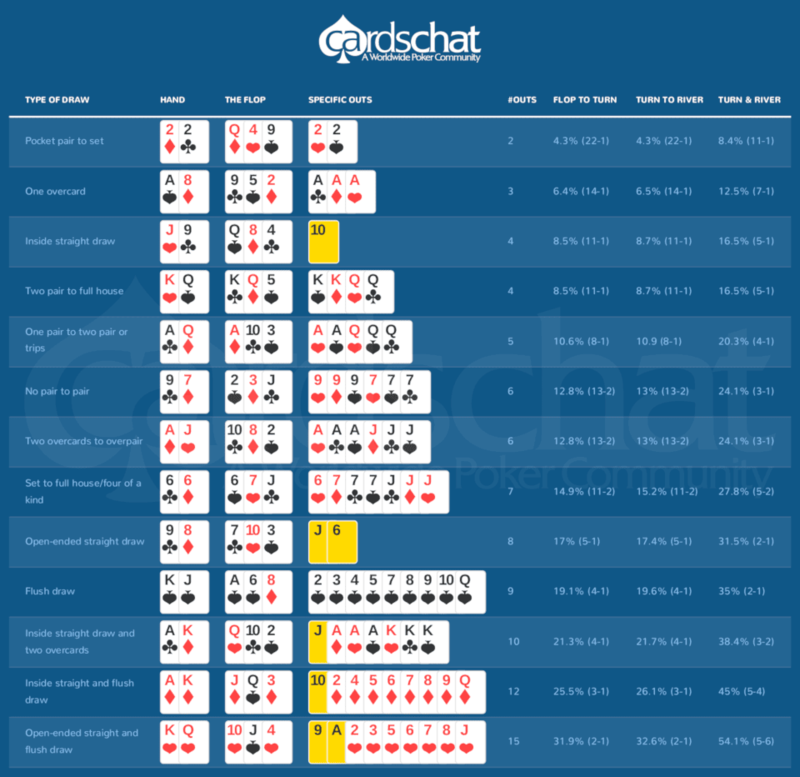 Download the Poker Outs Chart for Free! This chart displays some poker odds as well as recommended starting hands for playing poker. These hands generally have the greatest odds of winning any particular hand. 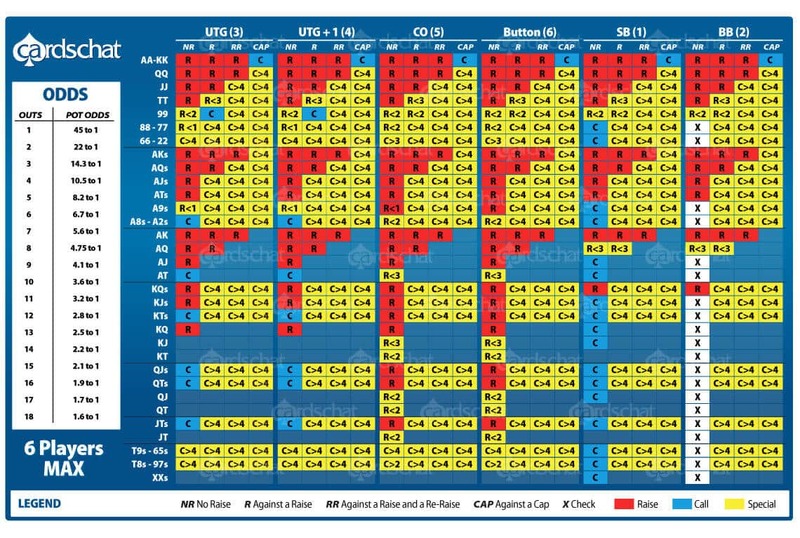 This helpful chart is available for free download, just click the button below. Why should I use a poker odds calculator? Poker is a hyper-competitive game with real stakes and real cash commonly riding on the line. This makes having an edge at the tables absolutely crucial, something that a poker odds calculator can easily provide. Effectively monitoring the game, it&apos;ll crunch the numbers for you, readdressing odds related to your hand and the hand of other players as you play. This information and data will allow you to exert a tighter grip on the action, making your play more effective in the process. Why is replaying your hands so important? By calculating pot odds in various scenarios you get a 'behind-the-cards' perspective as to why experienced players act the way they did and secure a mountain of chips. Besides getting an inside look into the minds of pros, by using our Texas Hold'em poker calculator you also discover the reasons why you didn't win last night's pot and be better equipped to win your money back next time. How much time should you spend studying plays? It all depends on how serious you are about wanting to improve your play. The longer you spend tinkering about with our Hold'em poker calculator, the finer you can hone your ability to mentally predict the odds. Other players might wish to use our free poker odds calculator only when the need arises, such as during a tight game. For best results, we suggest you run hands you've seen on tourneys or at your last poker night and use the pot odds calculator to study (and learn) how great poker players react when dealt a particular hand. Is studying plays more important than playing? Nothing beats the rush of playing for real money and there's no better way to learn poker. However, if you're in it to win the game, then studying plays on our Texas Hold'em calculator is definitely an ace up your sleeve. By calculating pot odds with this Hold'em poker calculator you'll familiarize yourself with a more technical way of playing; after all, poker isn't just about what your guts are telling you! Using our pot odds calculator you stand a better chance of analyzing a play correctly and making the right moves to ensure victory. How do poker odds calculators work? The terms “poker odds calculator” and “poker win percentage calculator” might seem like a bit of a mouthful, but using one – such as CardsChat&apos;s offering above – is actually pretty simple. You simply select the two cards you have, along with the related odds, then choose the two cards of your first competitor – add cards of other opponents as necessary. Once the calculator has all of this information, click into the center to address the flop, from there you&apos;ll be presented with the odds needed to read the table. What are pot odds and poker outs? The pots odds are the ratio of the current pot size when placed up against the odds of a contemplated call. What pot odds represent is the calculation of the probability of winning a hand with a future card, in order to estimate the call's expected value. It sounds a little on the complicated, but trust us it isn&apos;t, especially when you have the right tools by your side. The out card is the card that will essentially complete your hand. For example, should you be on a potential flush draw, with four hearts already in hand, then there will be nine hearts theoretically left to be claimed to complete the flush. So, determining the poker outs is basically figuring out what the odds are of finding the card to complete the hand you&apos;re aiming for. Can I use the calculator on my mobile? Absolutely, CardsChat&apos;s poker odds calculator is mobile friendly. You can find it in both the App Store and Google Play Store. What else can I do to increase my chances of winning? Lady luck is certainly going to have a hand in deciding how you fare at the tables, but her presence won&apos;t ever be the only determining factor. Poker is all about how you approach the game, so you're going to need to combine a poker odds calculator with an extensive knowledge of the game. Master the art of bluffing, study various poker game strategies, and commit to countless hours of game time, and you&apos;ll find that your chances of winning will increase rapidly. While you don't have to be a mathematical genius to play poker (although it can certainly help), it is worth knowing some of the basic odds, probabilities and percentages behind the various hands. That way you'll know the odds of your opponent getting a royal flush are around 649,739 to 1. The Wolfram Mathworld site has detailed odds on all the poker hands to get you clued up.